Woodpecker Information Page ... Species ... Physical Adaptations for Tapping and Climbing ... Possible Conflicts with Humans ... Before Cutting Down any Trees, Please Make Sure that there are No Nestings in your Tree! Woodpeckers, require food, water and shelter. They will visit fountains, ponds, birdbaths and pet water dishes to find their water sources, and they will search for shelter in any number of places. These include an opening in a roof or attic, a hole they have excavated in the sideof a tree trunk, in a branch, even in a cactus, for those living in desert areas. The easiest way to attract Woodpeckers to your property is to provide them with the foods they love! Woodpecker Mixes, as well as protein-rich cakes, dehydrated insects, nuts as well as fruits, are all winners. 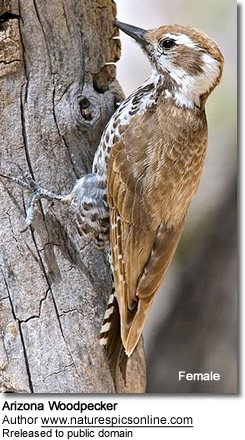 Often, woodpeckers will store food by wedging it deep into crevices. They prefer to forage in deciduous trees, but will also forage on the ground. Males tend to forage along trunks and large branches while females target slimmer, higher branches. If you don’t mind having a "wild" look to your property, consider leaving a dead tree standing or incorporating a fallen log into a woodland-style garden scene. These hunting grounds will attract red-bellies as well as other exciting woodpeckers. And as always, make sure you have a good supply of water available. Black Oil Sunflower Bird Seed attract small feeder birds to your yard, including woodpeckers. A year round energy source for birds. I found that the birds seem to prefer black sunflower to the grey-and-white striped. They are softer shelled, hence easier to crack open. They're also cheaper than the grey-and-white ones. Downy Woodpeckers also feed on Safflower Seed (a seed that squirrels, grackles, blue jays or starlings don't particularly care for. Sunflower Hearts provide a high energy boost for almost any bird species year round. Especially good during migration season. 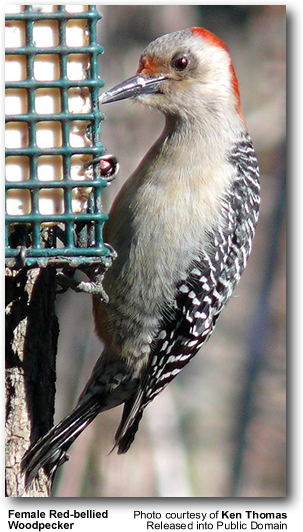 Suet Cakes are high energy food that are also commonly accepted by these birds. Please make sure that it doesn't get moldy, or this snack will make birds sick, as will any moldy food. In humid climates, it is best to store seeds indoor. 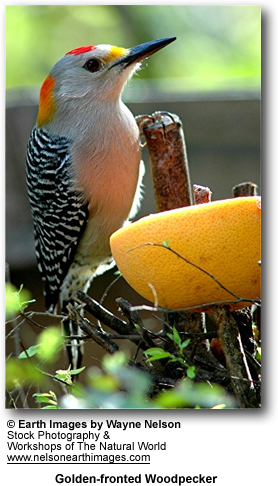 Provide more than one feeder, if large bird are visiting it at one time. Spread them out a little bit. This will allow small or non-aggressive birds to feed that would otherwise be bullied by other species, and at the same time reduce contact between birds - thus decreasing the chance of disease. Clean feeders regularly. Make sure seed is dry and free from mold. Store seeds in the garage in mouse-proof metal trash cans. In humid climates, you may want to store the bags indoor as they may get moldy outside. Moldy seeds cause fatal diseases, such as aspergillosis. If you have any dead trees in your garden, just chopping off the crown will allow woodpeckers to make their nest in this tree. Dead trees are easier to excavate than living trees, and are, therefore, preferred for nesting as well as offering crevices for insects - thus serving as good, natural foraging places as well. 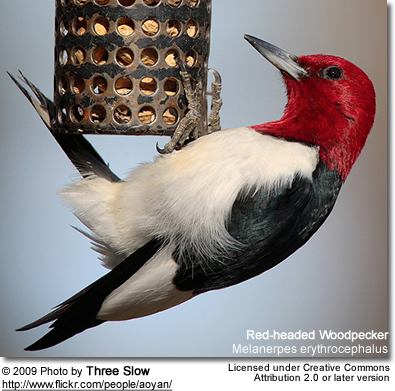 They often readily accept nesting boxes, such as Pileated, Red-bellied or Red-headed Woodpecker nest boxes. Mount the nest box in the fall or winter to give it a chance to weather before spring (breeding season). Place 1 or 2 inches of dry wood chips in the boxes. Sawdust will not ventilate and dehydrate as well as chips and chips are easier for birds to rearrange or pack in and out. Fill a box intended for a Flicker. They will excavate the chips. They rarely use hanging / swinging bird houses. Attach to a stable surface. Make sure there isn't something in them other than intended. Nestboxes also attract squirrels, mice, snakes, insects and unwanted birds, such as house sparrows or starlings. Make sure desired birds aren't being driven away. If they are being intimidated by more aggressive bird species, it's a sign they are in peril. Nothing is more disgusting than finding a family of dead birds, adults and babies, around a nest box. Used nests are often tainted with fleas, mites, and lice waiting for more inhabitants. Feeders can spread parasites and disease. Remove nests after rearing and clean and spray nestboxes and feeders with a mix of 90% water and 10% chlorine bleach. Replace wood chips in nestboxes before the next nesting season commences. 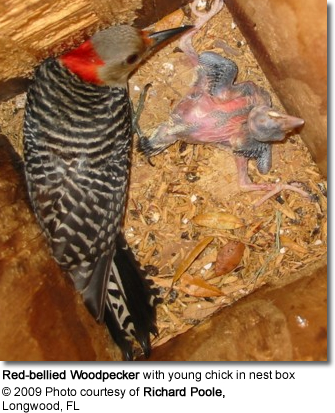 Are Woodpecker Nestlings In Your Tree?
" Last week I received two sets of nestlings that became orphaned when their tree-homes were cut down. Three nestling Blue Jays lost their mother when their tree was cut, and five Woodpeckers so tiny their eyes were still closed nearly got lost in the leaf litter. I got to talk with one landowner, who admitted it never occurred to her that anyone might be living in that dead looking tree. She was mostly concerned that her own home not be squashed should the high winds take it down. The woodcutters were at the job site for hours cutting and clearing up, so the mother most likely took off. I've spent a several days feeding the tiniest birds every hour, and as of this writing both sets of babies are doing well. Hopefully they will all make it to freedom eventually, though no one can raise baby birds like their own mothers. If you are a landowner thinking about having a tree removed, please consider observing that tree for a few days before taking action. You may be surprised to find you have some feathered friends who only need a few weeks to go from nestling to flight. If you can afford to be patient, knowing you've helped a few songbirds thrive and multiply for another season in an increasingly dangerous world may be your reward. If you absolutely have to remove a tree, keep an eye out for nests and birds. "Re nesting" is an option. If a nest or surrogate nest with babies in it is thoughtfully placed at about the same height in a nearby location, the mother will frequently return once it becomes quiet enough for her to hear her nestlings' calls. Keep watch and if that doesn't work, contact your nearest wildlife rehabilitator. Handle the baby birds carefully, the mother will not abandon them because she "smells" human scent on them; most birds have a poor sense of smell. Not everyone takes in birds, but most rehabilitators are willing to help you find some one who does"